Born: March 15, 1767, in Waxhaw, South Carolina... Jackson embodied the ideal of the self-made American man, and his populist appeal lay in his message of inclusion against what he characterized as entrenched establishment interests. He frustrated the professional politicians of Congress with his insistence that any man should be able to hold elected (or appointed) office and by his forceful and effective use of the presidential veto and bully pulpit. Critics charged that his ballyhooed disenfranchisement of establishment interests was just a cover for the patronage and installation of his own supporters... Died: June 8, 1845. Economic policy cemented Jackson's legacy as a populist. When South Carolina nullified a federal tariff that displeased the state (South Carolina Nullification Crisis), Jackson threatened to collect the funds at gunpoint. The state backed down. When Whigs in Congress brought up a bill to charter the Second Bank of the United States -- a private institution that held Federal funds, sold U.S. bonds, and had undue influence over interest rates, but was beholden to no voter -- in 1832, Jackson vetoed it, dismantling the bank; this was the first time a president justified a veto on policy grounds, rather than on constitutionality. For much of the American public however, Jackson's reputation was built not on money matters but on a lady's honor. When Peggy Eaton, the wife of the secretary of war, was snubbed by other wives of cabinet members, Jackson saw parallels with his own late wife's reputation and took the opportunity to dissolve his cabinet for a year, meeting with an informal group of advisers he called the "kitchen cabinet" instead. Not coincidentally, he was able to purge anyone who supported his hated vice president, John Calhoun. Britain and France both tried to keep the United States from freely trading with the other. In 1830, however, Jackson negotiated an exchange of shipping rights with the British West Indies. By 1836, problems with France dating from the Napoleonic Wars reached an amiable conclusion. 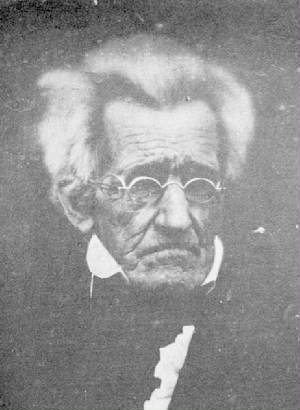 Closer to home, Jackson recognized the independence of Texas in 1837 and his administration instituted a policy of forced relocation of Native American nations. Although Jackson won more electoral and popular votes than any of his opponents in 1824, his lack of a majority gave the House of Representatives the power to choose a president. Frustrated by what he considered a stolen election, Jackson ran again and won in a landslide in 1828. His connection to the working man ensured him reelection to a second term in 1832. After his presidency, Jackson remained a potent force in American politics and the success of two of his protégés, Martin Van Buren and James Polk, can be traced to "Old Hickory." Credit: © 2002-2003 PBS/WGBH. Web site produced for PBS Online by WGBH. Web site ©1997-2002 WGBH Educational Foundation.